From the Vine Studio has been designing and creating one of a kind, decorative gourds since 2002. Since that very first gourd we have made every effort to create gourds that reflect the inner spirit of each gourd. From the beginning it has been our goal to produce a unique work of art that our clients can connect with. Granted our first attempt was somewhat plain but it was an eye opening experience. We realized we had found our niche. 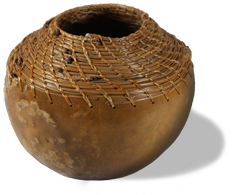 We had tried many types of art mediums only to find through our first gourd weaving that we were addicted. Since that time we have grown with this art form. Each piece reflects movement by use of color and carving long, fluid, curving linear elements. It's only through years of stitching long leaf pine needles onto countless gourds, that we have perfected our craft. Learning from every gourd we create that each stitch is as important as the next and that production work only leads to dissatisfaction. We take great pride in our gourds and can only create a limited amount each year. Each of our gourds are started and sometimes finished in Lawton, Oklahoma; on occasion some are finished on the road or at art festivals. Our inspiration comes from nature walks in the Wichita Mountains Wildlife Refuge, a mere 5 miles from our home. Fishing the nearby lakes can also inspire, but in reality, it can at times be a distraction. We truly hope you enjoy our decorative gourds and we thank you for taking the time to visit us. We can honestly say that we would rather be stitching gourds than writing text for a website or hanging a sign on our studio that says "Gone Fishing".